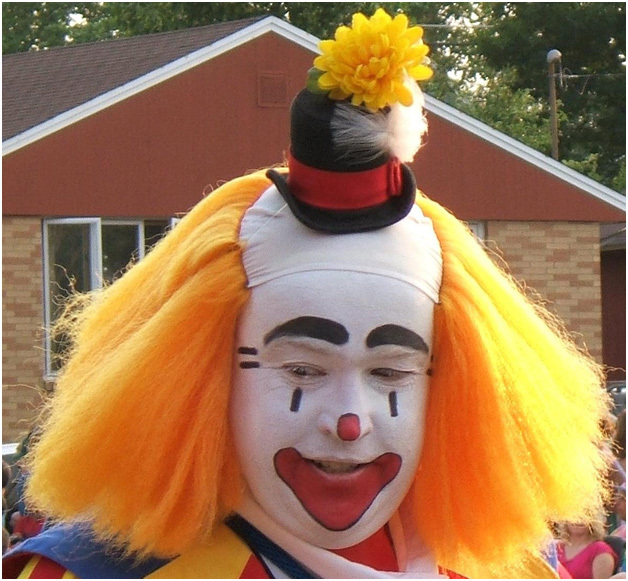 So Iwas snarking at Katy’s clowns when for the first time in my long life it dawned on me what I was seeing. Not just the tired decorating of “yesteryear”. What clowns are, I think, is 1920’s-1970’s era American language for alcoholics and alcoholism - before we developed modern language for alcoholics and alcoholism. In our middle 30’s Len and I ‘woke’ to a reality that is so obvious now but was so surprising to us then, i.e., alcoholism. Both of our families were hugely influenced by out-of-control drinking and out-of-control teetotalism/abstinence. It started with our grandparent’ generation (and before, we presume) and was still roaring along inside the drunk and sober lives some cousins and siblings, as well as inside our own selves. It was an interesting time for us. Yup. Here are some characteristics about clowns. You might see the coincidences. Sometimes clowns are charming and funny. Sometimes they act outside the accepted lines of how grown-ups are allowed to act – this is delightful to kids and surprises other adults. The clown with the flower that squirts water in the face of an important person? That’s fun. Just like your cool uncle who won’t take “crap” from his boss anymore – so he loses his job and now his family is going to live rough until his unemployment runs out and he gets another job that he will keep a few months. Betcha two 36-packs of gas station beer I know what he will do during the day while his wife goes to work. Or the aunt who hates her job yet gets up every day and goes to it and then comes home and does very damn thing she ought to do while sucking all the joy out of the air. Did she grow up in the chaos of alcoholism and so chose to never mess up – and she never has? There’s often a mean clown who chases the fun clowns to make them do what they ought to do. The Jekyll and Hyde clown? The adult in some kid’s life who is sometimes violent and the kid is wary. But also, for reasons it take the kid years to understand, that adult can be really witty and imaginative and fun. You just never know. Artists say they paint what’s scariest to take away its power. Writers write it. Poets say it. Women tell each other #MeToo. Clowns are low-brow shamanism. Have you ever observed one adult giving another a clown figurine? It’s not a common gift these days, but I can still hear, “That clown just reminded me of … “. Clowns never remind people of kind, normally-functional, give-and-take people. There will be a telling edge in there. Or, you’ve seen this “art”. A clown in heaven is talking on a phone to someone on earth; big ole red clown shoes and all. It’s ridiculous and poignant and why did that beloved relative die so young and leave us behind? I don’t have much of a point besides this. Clowns are and were evocative language - without the accusing words – that reminded us that the people are flawed, dear, crazy, scary, and ours. I’m very glad that as a culture, we have evolved beyond the clown motif. So what’s with the Zombies? Disclaimer and apology – Not every person who loves a clown is unconsciously dealing with their alcoholics of yore. People like what people like. But it just seemed interesting enough to me to write about; how closely the clown theme stood in as a totem for what it was like to live with family members who were alcoholic. Never thought about it but, yeah! I come from an alcoholic family and have spent many, many hours in Al-anon meetings trying to unravel my life and the way I react to things. It’s helped! We are 30 years into understanding the patterns, and yet still so often come up against those same old same old responses to stress. At least now, when either of us have a BIG reaction to whatever (this morning it was the awful weather and plans having to change fast) ... at least we know to slow down and look at what's being triggered.